If you’re looking for a more traditional part of the Middle East, where ancient ruins meet vibrant marketplaces and towns, a holiday to Jordan could be for you. Jordan’s captivating history and mesmerizing monuments attract thousands of visitors each year. Take a hike up to the ancient city of Petra. Here you’ll discover an entire ancient city carved into a mountain. The country is home to the world-famous Dead Sea. It’s salt density is so high, you can float on the water with little effort - just remember your swimming goggles as the sea can irritate your eyes. Flights to Jordan from the UK are easy to find, and as long as you get the timing right you should be able to get a great deal. 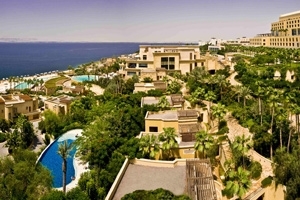 As for Jordan hotels, take a look through our range to find the perfect accommodation for you. Our selection of resorts will suit all budgets. We offer cheap Jordan hotels as well as four and five-star luxury accommodation. Rest assured, we have you covered. If it’s cheaper accommodation in Jordan that you’re after, then look no further than The Kempinski Hotel Ishtar. Here you’ll be staying on the shores of the lowest point on Earth, the Dead Sea, which has many health benefits, especially for your skin. If you want to stay in one of the best hotels in Jordan, then consider the Movenpick Petra. Here you’ll be staying at the entrance to the stunning rose-red city of Petra with all the luxuries of a five-star resort. Petra - Petra is an entire city that’s been carved into rock, it’s an impressive sight to behold. Embark on a journey through time and see the Treasury, the Royal Tombs and the High Place of Sacrifice. The Dead Sea - At 400m below sea level, the Dead Sea lies at the lowest point on Earth. With such a high salt concentration, the Dead Sea offers lots of health benefits, as well as being easy to float on. Amman - No visit to Jordan would be complete without a trip to the capital, Amman. Here you’ll find lots of shops as well as cosmopolitan bars and restaurants. Wadi Rum - Also known as ‘The Valley of The Moon’, this is a valley that has been cut into a sandstone and granite rock. Here you’ll find lots of ancient rock paintings. However you choose to spend your time in the exciting country of Jordan, you’ll find the perfect 2019 or 2020 hotel with Travelbag. Here is just a selection of our favourite and cheapest hotels in Jordan. Please use our search panel above to find your perfect choice. Located at the entrance of the magnificent rose-red city of Petra, this Mövenpick brings together the elegance of a fine resort and the timeless beauty of Petra. Flaunting the pageantry of a royal residence with antiques, oriental architecture and intricate interior design, the luxurious Mövenpick Resort is one of the ... most notable resorts in the Jordon. Nothing really prepares you for this amazing place and this hotel is right in the heart of it. Petra, is without a doubt Jordan’s most valuable treasure. The beautiful Mövenpick Resort and Spa is situated at the lowest-point on earth, the northeastern shores of the historic Dead Sea. This environmently-friendly spa resort has a distinctive rustic ambience, enhanced by its unique village setting. The year-round warm climate, ozone-rich air and surrounding mineral rich Dead seawater will revitalise ... your mind and body and experience the chance to float in the relaxing waters. This tranquil location will guarantee you a relaxing and unforgettable holiday. 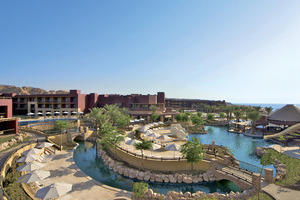 The Mövenpick Resort Tala Bay is situated on the southern shores of the Red Sea at the Gulf of Aqaba, overlooking panoramic views of the coastal mountains. Its just a short drive from Aqaba main town and is in an idea location for the perfect beach holiday. This is a ... new resort and Tala Bay is one of the most exciting new developments on the Red Sea, with plans for a marina, shops, restaurants, a golf course and more. At present, it is a quiet resort, ideal for a relaxing break. 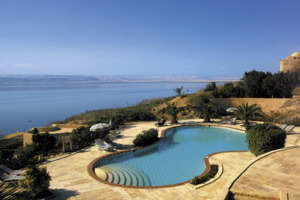 The Kempinski Hotel Ishtar lies gracefully in the Jordan Valley, on the shores of the largest spa in the world and lowest point on earth, the Dead Sea. This stunning property is a masterpiece of Babylonian inspiration and is carved in local stone. The hotel is set on the longest ... beach in Jordan, where ancient olive trees mingle with bamboo palms, providing guests with absolute privacy in an exclusive setting.